2017 Prospectors Big 6 WCGP Results – Since most of the Ox Motorsports Honda crew is in Baja pre-running for the Baja 1000 in two weeks, Zach Bell had to recruit family and friends to help him at the 32nd Annual California Grand Prix/Buddy Goosen Memorial, hosted by the Prospectors M.C., at the Quail Canyon MX Park, November 4-5. 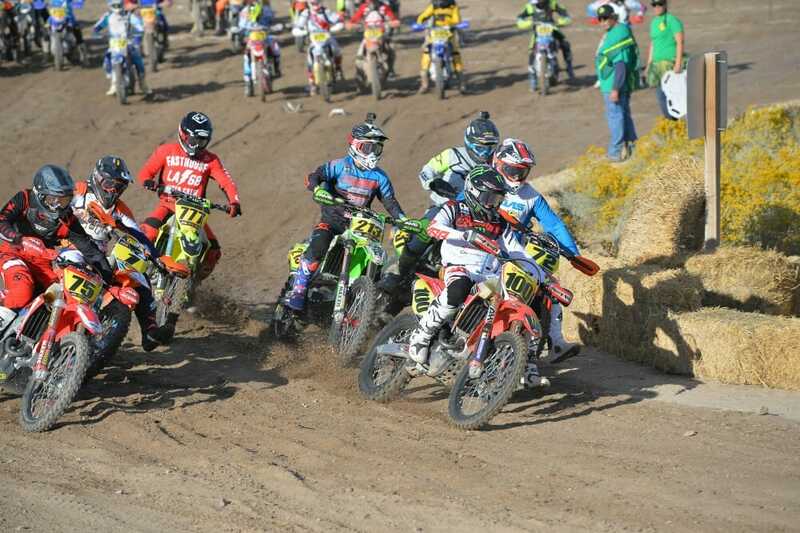 Despite the trip back to privateer life, however, he managed to pull off his fourth win of the season at round seven of the eight-race AMA District 37/Maxxis Big 6 Grand Prix Series and its featured AMA Big 6 West Coast Grand Prix (WCGP) Series. Bell had to work for it, though, as Johnny Campbell Racing (JCR) Honda’s Trevor Stewart and FMF/Maxxis/RPM Racing Team KTM’s Eric Yorba both passed Bell when he pitted the lap before them. At the finish, just nine seconds separated the three of them. Going into the series finale next month, Bell carries a comfortable 29-point lead over Stewart, 184-155. Rocky Mountain ATV-MC/Precision Concepts Kawasaki’s Justin Seeds remains third in points at 121 after finishing fourth on the day with defending series champ Yorba closing the gap with 116, but both are mathematically out of the hunt for the number-one plate. “Right now, I’m not even worried about the championship,” Monster Energy/Lava Propane/Answer Racing CRF450RX-mounted Bell said. “I’m here to have fun and learn about the off-road scene. I’m doing some hare & hounds next year and some WORCS stuff so we’re just testing the waters, getting everything sorted out. “Myself, I’m used to 35-minute motos and this is an hour and a half. Luckily, I can sprint really well and I got myself to a really good lead [after] I got the holeshot, so I was like 20 seconds [in front]. Then I pitted; they got by me so I rode behind Yorba and actually saw some really good lines he had so I picked up on those. All three podium finishers set such a fast pace that Seeds was more than five minutes behind on his Maxxis/GoPro/Answer Racing KX450F. CST Tires/Maxima/Fasst Company CRF250R rider Beau Baron came from the second row to fifth overall, his WCGP Pro II win moving him into the class points lead over teammate Mitch Anderson, who had to sit this one out while recovering from injury. Northland Motorsports/Precision Concepts/Troy Lee Designs KX250F-mounted Clay Hengeveld led Pro II for a bit but couldn’t hold off the current class champ and finished four seconds behind Baron for sixth overall. Pro Ryan Reina and WCGP Pro IIs Chance Fullerton (who rode his old YZ125 due to a problem with his YZ250), Nick Stover and Jake Alvarez rounded out the top 10 overall.